A Fat Girl & A Fat Horse: More changes on the horizon! You might be saying "That's not horse related! "....BUT IT IS! Because this house came with 10 acres of cleared farm land. The plan has always been that eventually, G and I would be able to buy a place where my horses could come live with us, but neither of us expected this to happen so soon. Because of unforseen circumstances, my parents approached and asked if we would be interested in buying a house together. We jumped at the opportunity, especially with the little one coming in September -- we could have stayed in the city with one baby, but I am in love with the idea of raising my child on a farm and with the idea of multi-generational homes. I get along well with my parents as an adult and honestly, I'd be living with them if I wasn't living with G.
And I'm gonna be honest, I had reached a point where I wondered what the sense was in keeping my horses--I never see them (especially with how ill I've been this winter) and don't have the time or resources to do any consistent work with them. So...as soon as the ground thaws enough to drive fence posts, they move in! There is so much to do with this property -- there are no fences and no barn. On the one hand, it makes things a little more difficult, but on the other hand, we get to set it up exactly as we want it. I've never had that luxury before! The house needs a lot of work inside, too. 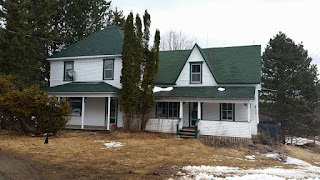 It has great bones and lots of beneficial add-ons done by the previous owner, but needs new flooring in most of the house and either paint or wallpaper in just about every room. The kitchen also needs a complete overhaul. It'll be a long, slow process, but I can't wait to share it with you guys! And I can't wait to have my feral ponies home to remind them of their P's and Q's. I got to bring my mare home last July and it's been so amazing to see her every day! You'll love it! Congratulations! That will be awesome. You can start small with a run in shed and a fenced area as you plan the big picture of multiple pastures and a barn for the whole 10 acres. I'm excited for you! This is so GREAT, & such good timing! I look forward to some posts about remodeling the house too (starting with the nursery, maybe? ).